Thomas McCormack was sitting on his train when his pup, Paddy, just came and sat down next to him. 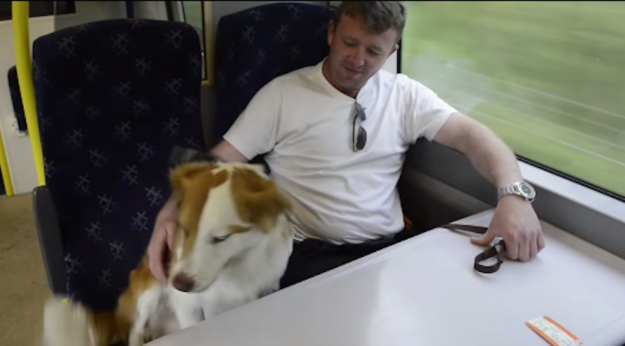 A dog in Scotland decided he missed his owner when he went to work for the day, so he hopped a fence and joined him on the train. Thomas McCormack from Croy, North Lanarkshire, said that he was completely surprised when he looked over and saw his pup, Paddy, had joined him on his morning commute. McCormack and Paddy reenacted his journey in a video for SWNS. The pup apparently had used a trampoline to hurl himself over a fence, and then tracked his owner all the way to his train car. Paddy escaped the yard before, but McCormack couldn’t figure out how. Finally, a neighbor told him he had spotted Paddy using the trampoline. The father of one speculated that his dog must have figured out his escape route while playing with kids on the trampoline. “He’s a clever dog,” he told the Kirkintilloch Herald. BuzzFeed News has reached out to McCormack for comment. Watch more of Paddy’s story here.